Will the opponents of vaccination contend that it was nothing more than a coincidence that the unvaccinated portion of the African explorer's band of followers was attacked by fatal smallpox, whilst the vaccinated portion, although living apparently in the midst of the infection and in the same unwholesome condition, escaped the disease. We need only point out in reply to this paragraph it in no way affects our position, that where there is proper provision for isolation the vaccination of the entire population is totally unnecessary. In our last week's issue we commented on the extraordinary avidity manifested by the Wellingborough Board of Guardians in accepting the curious explanation offered by Dr. Crew concerning the vaccination of the child Ernest Edward Barley. It might have been, reasonably expected that a body of public officers would have exercised some measure of judicial reserve, but apparently the vast majority of the Board were ready to accept with unquestioning faith any explanation vouchsafed by the medical practitioner, however improbable it might be. If, however, the Board did not think it necessary to make an impartial enquiry into the subject, we are convinced that the public generally will desire to know whether Mr. Crew's condensed milk theory will bear examination. I have been in to see the child at all times of the day, and certainly many more times than Drs. Crew, Owen, and Thomas put together, and while I am not a medical man, I am a parent, and have been one long enough to know when I see a child whether it is well cared for or not, and I have no hesitation in saying that the child is both well cared for and properly tended, and I claim to know a little more about this matter than Dr. Crew. And now comes the most ridiculous statement in the whole letter  the attributing of the injury to Swiss condensed milk. A greater libel on the Swiss milk was never uttered. Is Dr. Crew unaware of the fact that this same condensed milk is largely recommended by the medical profession, and that in some of our tropical climates they cannot use any other than condensed milk for the bringing up of children? And was he, when he drew up his report, unaware of the fact that the mother had asked Dr. Thomas whether it would make any difference to the child if she gave it fresh milk instead of the condensed milk, and that the answer she got was that fresh milk was no better than the condensed, and that Dr. Thomas pointed to his own child as an example of what Swiss milk had done, at the same time remarking there was not a healthier child in Rushden. Surely Dr. Crew must have been ignorant of all this, or he would not have made such a statement. But perhaps one of the most important points in the report is, his remarks upon the change of milk, and upon this I particularly ask the attention of your readers. The change was made on Nov. 24th. Dr. Crew’s letter was written on 25th (one day after) and in it he makes the following statement, “The child is now supplied with fresh milk, and I am glad to say the arm is rapidly getting well,” clearly implying that the change in the condition of the arm was due to the change of milk, but will it be believed that Dr. Crew did not visit the child until the 26th a day after he wrote his letter. He was therefore informing the Guardians of the result of the change of milk one day before he knew anything about it. But waiving this point does he really mean to say that two days change of milk will bring about such an altered condition in the child’s arm? The real fact is this, that for three weeks the child had been under the treatment of Mr. John Ekins, of Raunds, and during that period had made some progress towards recovery. The thanks for its improved appearance is therefore due to Mr. Ekins, and not to a change of milk for two days; and now for the special benefit of Dr. Crew and others, I may say that after trying fresh milk for a week the child was not so well, and the mother to-day informs me that they have been obliged to go back to the Swiss condensed milk, and still under Mr. Ekins' treatment and the careful nursing of the mother the arm is progressing favourably. Dr. Crew towards the close of his letter speaks of this as “an exceptional case such as he has never seen before.”' Well, if he will take the trouble to go over to Raunds, I think he will find two or three such cases at the present time, of which was, I am informed, vaccinated about a week after the pure lymph was taken from Mrs. Barley’s child's arm - possibly with the same lymph - not very consoling to the parents. It is said that Nelson when he did not wish to see any signals from his Admiral's ship, would put his telescope up to his blind eye, and declare he could see no signal. Dr. Crew’s lack of knowledge concerning cases of injury resulting from vaccination may be due to some similar cause, but however that may be, cases exist, and that in our midst, and we are not going to be deluded by any such medical sophistry as that now advanced. It would have been more creditable to Dr. Crew if instead of making reflections upon the mother of the child and condemning Swiss milk, he had had the courage to acknowledge that the injury was caused by vaccination. It will be seen by the mother having to return to the Swiss milk for the child, that the condensed milk theory is altogether exploded. These then, sir, are the simple facts of the whole case; had I been so minded I might have placed them in stronger language, but they are before your readers, and it is now for them to judge. We are told in some of the papers that all the Guardians were well satisfied with the explanation of the Public Vaccinator; well perhaps they were, but it appears to me the question is not so much as to whether the Guardians are satisfied, as to whether the people who elect the Guardians are satisfied. If they are so well and good, but I am inclined to think that it is otherwise, and that the Board of Guardians were just a little too hasty in accepting the milk theory of Dr. Crew. Sir, I observe in the Wellingborough Post of Dec. 20th, a letter signed John Crew, in which that gentleman practically charges me with falsehood, in as much as he denies she accuracy of the statement I made with reference to the date of the change of milk. I have no desire to discuss this matter any further at present, than to vindicate my character, and for that purpose I ask that you will be kind enough to insert the enclosed declaration of the parents, confirming my statement. I cannot refrain from adding that I think Dr. Crew's wisest and most straightforward course, if he wished to correct any error of mine, would have been to have done so through the paper that published those errors, and which is the principal newspaper in this part of the county. It requires no microscope to see through this piece of policy. Dear Sir, Our attention having been called to a letter of Dr. Crew's in the Wellingborough Post of Dec. 20th, in which he denies the truthfulness of the statement of Mr. Boyd with regard to the date of the change of milk, we beg to say that Mr. Boyd's statement is absolutely correct. Dr. Crew further states that the mother of the child told him that she changed the milk the day after she came back from London and that the child was doing well. We beg also to state that that statement is totally untrue. one to the other that Jenner's teaching found favour at the outset. 2. That cow-pox is an infection attended by various serious risks, including erysipelas, and what has hitherto been called vaccinal syphilis. 3. That vaccinal syphilis is an inherent risk, and not due to any syphilitic matter mixed with the lymph, although it is so far akin to venereal syphilis as to be mistakes, for the latter. 4. That vaccination neither protects from small-pox, nor mitigates the severity of the disease in those attacked by it. These condemnatory statements by a physician and pathologist of the first rank, coincides precisely with those arrived at by that eminent scientist and naturalist, Alfred Russel Wallace, L.L.D., in his new edition of "Vaccination proved useless and dangerous". This coincidence is the more remarkable inasmuch as Dr. Wallace arrived at his conclusions from a complete study of 45 years of registration statistics. It is upon this evidence alone that a true and sound judgment can be arrived at. Dr. Wallace has lately given the result of his studies in his evidence before the Royal Commission on Vaccination, nor is this all; for from the front ranks of the medical profession comes Professor Edgar M. Crooksbank, M.B., who has recently given to the world the result of his researches upon this subject in his "History and Pathology of Vaccination". In this work a many of the arguments of anti-vaccinists are practically allowed ; this and much of the evidence that has been given before the Royal Commission farther proves the soundness of the arguments advanced by us for years past. In the House of Commons on Monday Mr. Channing said : I beg to ask the Secretary of State for the Home Department whether he is aware that up to the present no compensation has been awarded by the Treasury to William Cheney, of Rushden, Northants, who was illegally subjected to hard labour in Northampton Gaol, while undergoing a short sentence for failure to comply with a vaccination order; whether he is aware that William Cheney was in bad health previous to imprisonment, and has suffered in health from being forced to work on the treadmill and has been unable to work; and whether he will make further representations to the Treasury as to the question of compensation for Cheney? Mr. Matthews: Inquiries have been made by the Treasury Solicitor, and he cannot ascertain that either the magistrates or their clerk, or the governor of the prison have received any complaint or application from Cheney. According to the information supplied to me by the prison authorities, Cheney was in good health on reception and on discharge. In the absence of any complaint or application from this man, I am not in a position to make any further representation to the Treasury on the subject. Mr. Channing: Am I not right in understanding the right hon. gentleman when questioned on this case before to have stated that the man was entitled to compensation, on the ground that he has suffered hard labour contrary to the law? Mr. Matthews: If the man has suffered injury the State will be perfectly prepared to consider his compensation. Mr. Bradlaugh: Has not a similar case been decided where a man tried to recover compensation against the State? Mr. Channing: Apart from any physical injury he may have sustained, is not the man entitled to compensation for having been put to hard labour contrary to law? when several very long general discussions on vaccination were printed. Arrangements have now been completed for vaccination exemption certificates to be issued at Rushden. They are to be obtained at the police-court, at three in the afternoon, on the second and fourth Mondays in each month, commencing with Monday, October 13th. For the convenience of parents, it may be repeated that these certificates cannot be obtained for any child more than four months old. The certificates issued on October 13th can only be given, therefore, for children born on or after June 13th, and in the same way the certificates issued at the Court held on the 27th inst. will be for children born on or after June 27th. 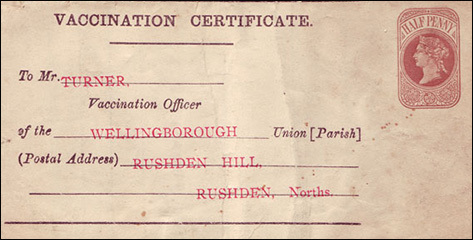 Unfortunately, the efforts made to secure the abolition of fees for these certificates were vetoed by the Home Secretary, and as a consequence the charge of 2s. is still payable. Rushden parents with conscientious objections to vaccination, who neglect to obtain exemption certificates within the allotted period, and afterwards refuse to have their children vaccinated, will have to face the ordeal of two summonses to the Wellingborough Police Court, the costs on the first summons amounting to 7s. 6d., and on the second, including a fine of half-a-crown, to 8s. 6d., but it should be borne in mind that the magistrates have power to make the fine any sum not exceeding twenty shillings. 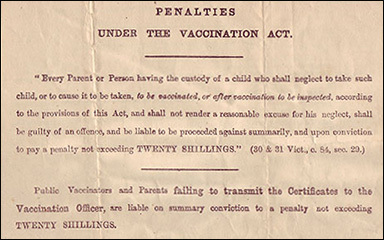 Joseph Reeves, John Gore, Herbert Chettle, Francis Clarke, Alfred Crouch, Rushden, were summoned under the Vaccination Act. Orders for vaccination were made in each case, the defendants having to pay costs. Vaccination - Twelve exemption certificates were granted on Monday by Mr. F. Knight and Mr. John Claridge.